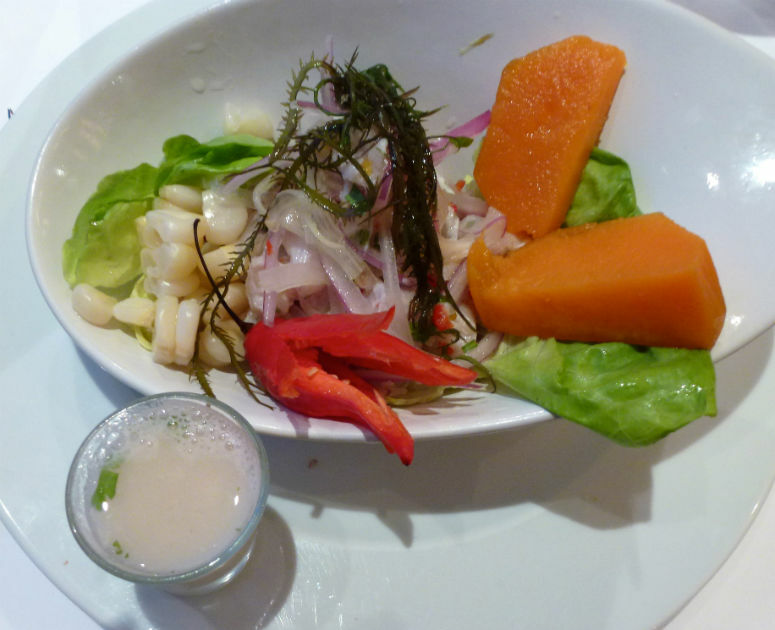 Before flying to Iquitos and embarking on the Amazon River cruise, we had two evenings in Lima, capital city of Peru, to explore Peruvian fine dining cuisine. Driving in to the city from the airport, my attention was caught by a striking structure jutting our into the sea. Our driver informed us that this was a restaurant, La Rosa Nautica. When picking two fine dining restaurants for our dinners, I knew I wanted to eat at La Rosa Nautica, for the location alone. 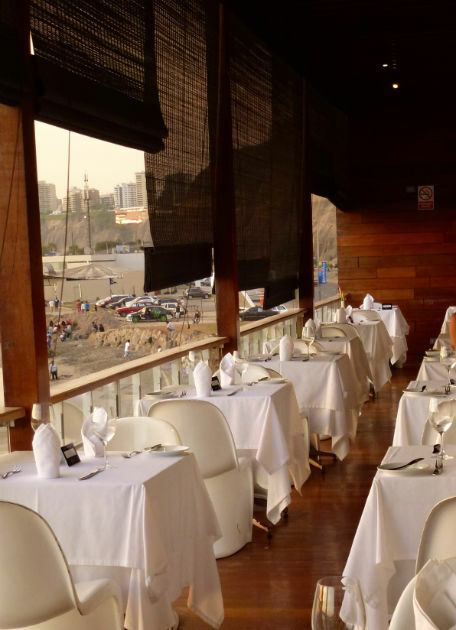 The second restaurant suggested for us was Cala, also located on the waterfront. Both were great choices. 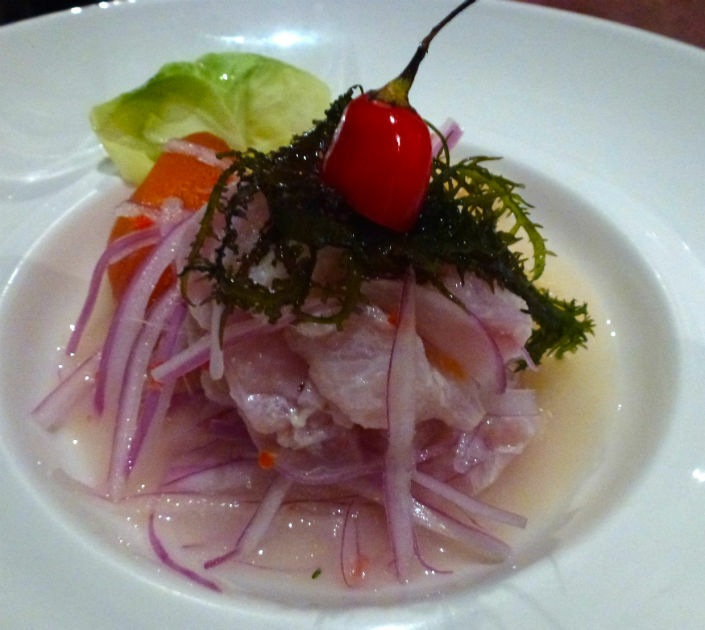 Overall the ceviche in Lima was among the best I have eaten anywhere in the world. Links to my original reviews of these two restaurants are at the end of this post. The main dishes that we ordered were different at the two venues, but in this story I show three items that we ordered at both places. 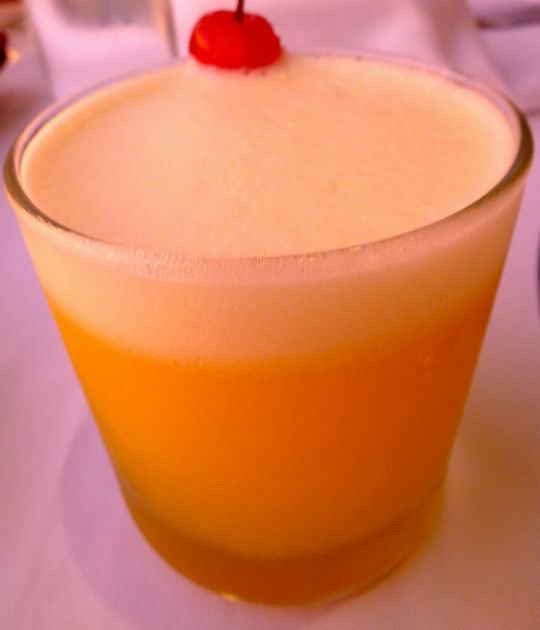 Although I usually don't drink alcohol other than wine, sherry or port, I had to try the Peruvian drink, Pisco Sours. Peruvian Pisco is a high alcohol content brandy made by distilling local grapes in copper pots stills. There are different types of pisco depending on the grape used. Pisco achalado is produced from a blend of local grapes. 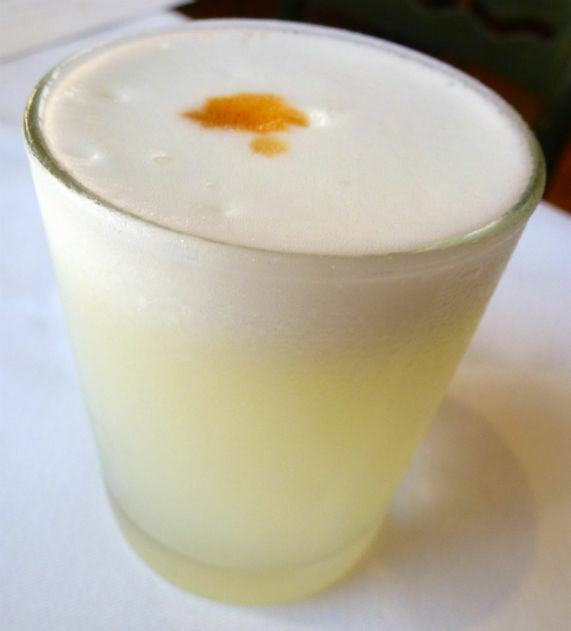 At La Rosa Nautica I had the straight Pisco sour - pisco blended with lemon and sugar. At Cala, from their list I chose the pisco acholado with passion fruit juice, lemon and sugar. Both were tasty and I got quite a buzz from the alcohol! On obvious appetizer choice at both restaurants was the ceviche. Ceviche is a marinated seafood dish. Depending on location the fish or other seafoods used varies but in general the marinade is citrus based, lime or lemon, and then various spices add a unique flavour to each creation. At La Rosa Nautica the ceviche consisted of of scallops, octopus and fish marinated in lime juice and Peruvian chilis, served with yucca and corn. No cilantro so I loved it. At Cala, the traditional ceviche consisted of flounder lemon juice, chili, cilantro and onions with glazed sweet potato and corn grains. I can't eat cilantro so I opted for the grilled tenderloin carpaccio appetizer but the verdict on the ceviche from my cilantro-eating dining companion was that it was superb. For dessert, at La Rosa Nautica my attention was caught by the Antigua Ponderacion. The literal translation of the Spanish word ponderacion is consideration or steadiness - I couldn't get the link to dessert. But after some further research I found that ponderacion in Peru is a dessert derived from the Arab-Andalusian cuisine brought to South America by the conquistadors. I knew about the Spanish influences on Central and South America but had forgotten how Spanish culture and cuisine had in turn been influenced by the Arab culture. There is a fascinating article about this, which I listed below. 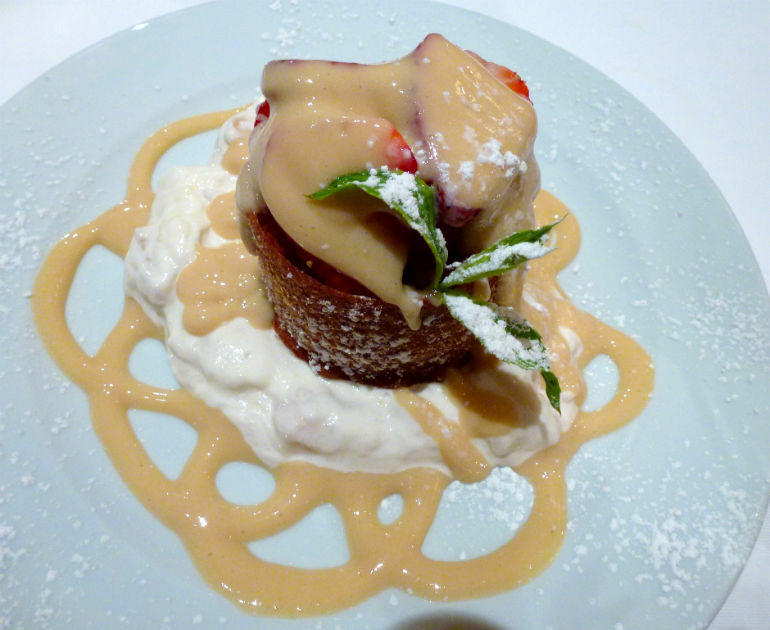 Ponderaciones: This dessert is made by molding dough into a swirl and frying it. The fritter is then served with a sauce, usually an egg-yolk based custard and fruits. We ordered this dessert at both restaurants for comparison. At La Rosa Nautica the dish was listed as Antigua Ponderación - served with strawberry and chirimoya in an English sauce. 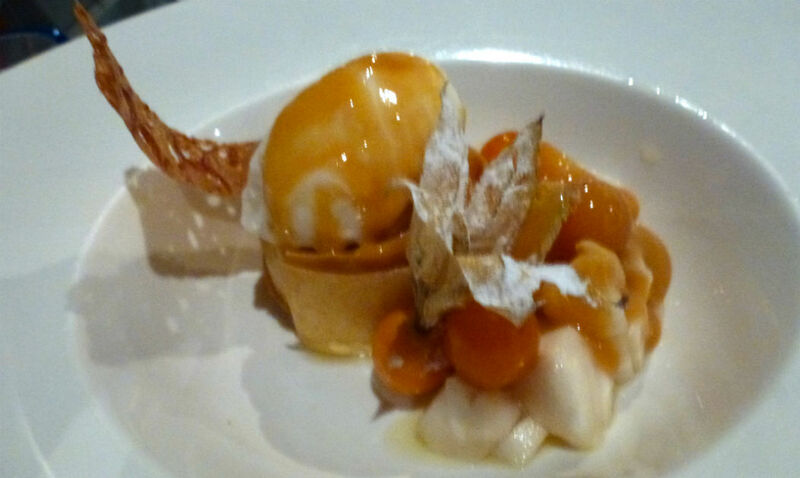 Cala's version was Crocante (crispy) Ponderacion; a sweet dessert stuffed with lemon cream, chirimoya foam, ice cream of guanabana and aguaymentos, and caramel sauce. That lead me to further research as I had no idea what either guanabana or aguaymentos could be. Aguaymentos is a Peruvian ground cherry. Guanabana is a fruit of an evergreen tree common in central and northern south America. The fruit is known by several names - soursop, custard apple and chirimoya. In Asia it is called durian. Both restaurants were wonderful. We had glorious sunset views, good service, and great food. And when writing my reviews, I learned a lot of new information. Love that!